The Friends of Rouge Park have announced three new activities that will happen over the coming weeks. 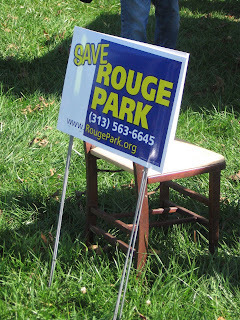 There will be a dedication of Rouge Park in Town Youth Camp at West Chicago and West Parkway. This will happen this coming Thursday, August 2, at 2 pm. They will also have a planning meeting for the Fall Rouge Park 5K Benefit Run next Wednesday, August 8. This will happen at 6 pm in Chick's Bar (18550 W Warren Ave - (313) 441-6055). Last, but certainly not least, their regular monthly meeting will be on Wednesday, August 15 at 6 pm. As always, this will happen at St. Suzanne Church (9357 Westwood - (313) 838-6780).